As current affairs continue to move at fast pace, the ongoing Amani Itakuya series on peacebuilding again needs to be disrupted – following one of my favourite slogans: Kwa kujenga amani, inabidii kusikia vita (To build peace, one must understand war). M23, after a unilateral ceasefire declared last weekend, officially ceased to exist as an armed rebellion per communiqué of November 5, signed by the movement’s military leadership. At this point it has been roughly 5 hours since FARDC troops had reconquered the last two M23-held hills – Runyoni and Cyanzu (south of Bunagana, the movement’s former political headquarters and one of its economic lifelines bordering Uganda). According to M23 sources, at this time the bulk of senior leaders (Sultani Makenga, Innocent Kayina, most probably also Yusuf Mboneza, Vianney Kazarama, etc.) must still have been somewhere on and around these hills, perhaps partly still on their last military positions against FARDC and their MONUSCO back-up. Shortly after the communiqué was issued from Kampala (and not before, as some twitter rumours indicated) their phones went off. An unconfirmed number of (mostly young) combatants surrendered to either FARDC or MONUSCO throughout the day, while others were said to have crossed the border. That is where the rumour of Makenga having fled to Uganda first flared up, while his colleague Kayina was suspected in Rwanda. Noteworthy to say, at the time of its official dissolution, M23 must have had between 300 (FARDC estimate) and 600 (M23 claim) combatants under command. Most likely, the real number was around 400, with possibility of other dispersed across the territory lost during the precedent weeks (Kiwanja, Rutshuru, Rumangabo). However, despite those rumours, little information came up either con- or infirming the alleged trajectories during November 6. It was only one day later – the day of this post – that news agencies, one after another came up with breaking news of Makenga being held by UPDF troops on Ugandan soil. Earlier the same morning, some of the phones of senior M23 members had been switched on again. While M23 members and other observers denied Makenga’s preliminary detention in Uganda, anonymous UPDF and government sources in Kampala claimed the contrary, adding that 1,500-1,700 combatants were also under Ugandan custody. How to make sense of this? On the numbers, few experienced analysts will doubt the inaccuracy of such high numbers. A most reasonable explanation (if all that is not a PR game anyway) would be to count dependents and unarmed members of the group. Doing that, such a high number may be possible. Additionally, various sources still state that not all M23 have accompanied Makenga (and neither Kayina) at this point. The second question on Makenga’s whereabouts was even more tricky throughout the afternoon. Contradicting anonymous sources, spokesperson Lt.-Col. Ankunda of the UDPF denied knowing about the rebel general. Little later, government spokesperson Ofwono Opondo joined the debate and officially announced Makenga being held by UPDF troops in Kisoro – a southwestern Ugandan town at 10km distance from Bunagana. While the Ugandan government says it had informed all important stakeholders about these events, it remains unclear at this point, what will happen with M23’s military head. While searched by the Congolese government (that may well demand his extradition) and under US and UN sanctions, there is neither an ICC warrant nor a Ugandan prosecution file against him). Nothing, in addition, is known so far about his current status in Uganda – refugee, detainee, private, civilian, military, etc. From Runyoni and Cyanzu, Makenga and his escorts could have made their way to Ugandan territory at some point within the past 60 hours. Another group under leadership of Col. Kayina seems to have detoured via Rwandan territory but have rejoined Makenga’s part later (in Kisoro, the Uganda-Rwanda border is as close as the Uganda-DRC border), given the Rwandan governments denial of harbouring any M23 members. The map schematically (actual indications may differ from reality!) 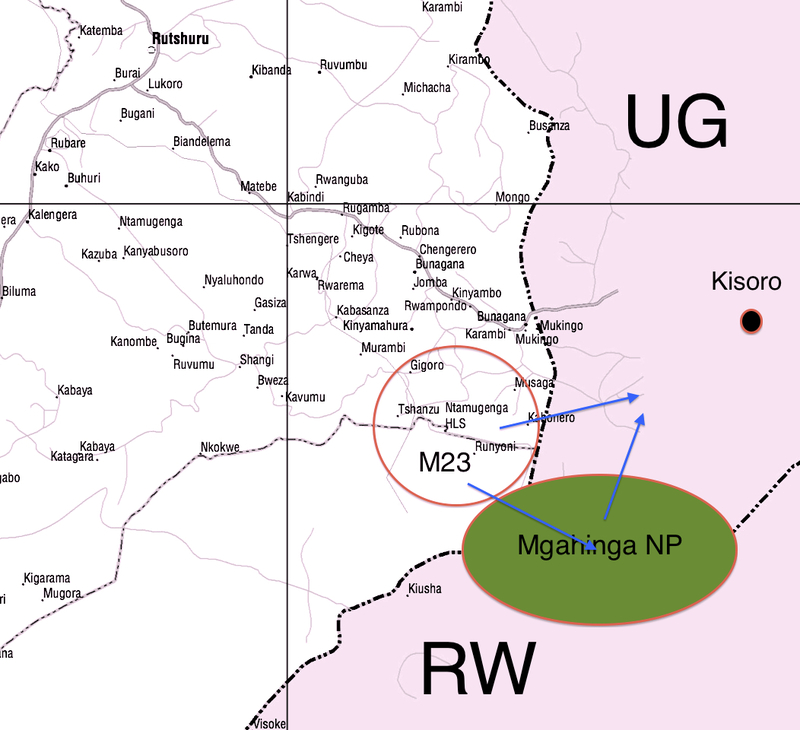 shows the last areas under M23 control until November 5 and possible cross-border routes taken by Makenga (up) and Kayina (below) groups Mgahinga national park. Big question: If this is accurate, why such as choice? One explanation could be Makenga’s strained relations with Rwanda – since 2009’s disappearance of Laurent Nkunda his trust had been lastingly undermined. Another guess would be Uganda’s perceived neutrality as a broker of Kampala talks, while international pressure on Rwanda has been that hard that it may be difficult to host Makenga (in addition to Mutebusi and Nkunda). Also, the separation of M23’s two top commanders could also indicate a twofold exit strategy. However all this is for the arena of rumours so far. As a rising number of accounts underline the presented scenario, and previously contradictory information has been converging in the past hours, this may represent a – currently – plausible reconstruction. Not more not less than that and the coming days will certainly have more answers to details surrounding the described events. Perhaps informed comment will minimise potential inexactitude. Yes, indeed. Sorry for lack of reply and thanks to Neil for taking up on this… Lots of militia commanders take on such codes, actually. Late response to Bjorn, it was his radio code name. Innocent Kaina they transfered to IQ – or India Queen, also he spent some time in India on vacation, but claims his name is not related to the travel or time spent in India. Thank you for the fact-checking. Very interesting. Just a question (that is irrelevant), why is Kayina called “Indian Queen”?